“Mars is salty so any water that flows in or on the surface would be salty as well,” lead researcher Alfred McEwen, with the University of Arizona’s Lunar and Planetary Laboratory said today. Summertime on Mars is bringing water to the planet’s surface, suggest NASA scientists who on Wednesday unveiled pictures of slender carvings in the sun-facing sides of crater walls on Mars that are believed to be etched by flowing briny water. Salts also would suppress the water’s freezing point, making it plausible that the dark, finger-like features were carved by liquid. The streaks range from 0.5 yards to 5 yards wide and stretch hundreds of feet, far smaller than previously detected gullies. They are concentrated on rocky, equator-facing slopes. The streaks also are highly seasonal, some growing by more than 600 feet over two Earth months, said University of Arizona researcher Lujendra Ojha, who was an undergraduate at the time and who is credited with the find. The features appear in the late spring to early fall, suggesting a material that disappears fairly quickly is involved. There are other explanations for the channels, which were spotted by photographed by NASA’s Mars Reconnaissance Orbiter, including releases of frozen carbon dioxide, tracks from dust devils or rock slides. But those events are not necessarily seasonal, making them less likely than water to be the proverbial smoking gun. The lead scientist of a proposed new mission to drill into the subsurface Martian ice said the saltwater find is interesting, but probably not applicable for a search for life on Mars. NASA currently has one rover working on the surface of Mars and plans to launch another mobile geology station in November. Neither, however, will reach the areas that show seasonal changes. 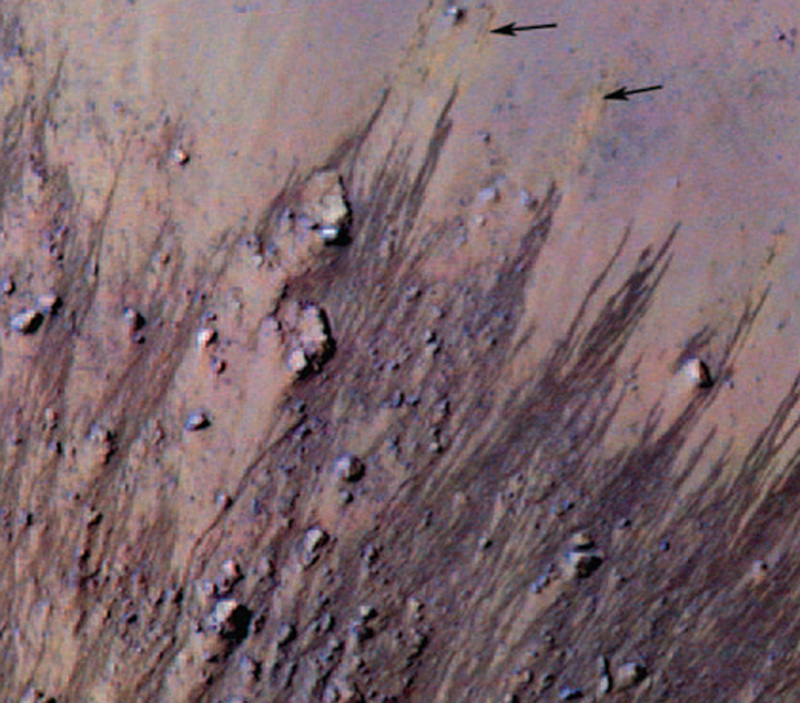 “What’s really exciting to me is that it shows a new active phenomenon on Mars. It shows how little we really know,” McEwen said. Previous Spacecraft For Jupiter On its Way!